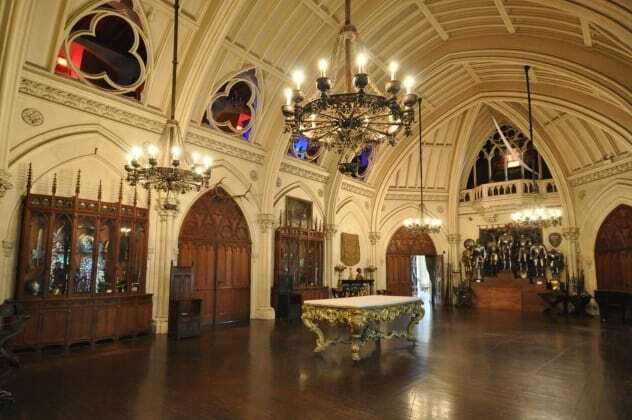 The 60-room Belcourt Castle in Newport, Rhode Island, is one of the most haunted houses in the US. The haunting is believed to be connected to some of the antique items kept inside the mansion, including the chairs found in its ballroom. Visitors often complain of an uneasy feeling when standing next to the chairs. Some say an unseen force resists them when they try sitting in the chairs. Others who managed to sit in the chairs say they were mysteriously thrown out of them. Besides the haunted chairs, the ballroom contains a suit of armor that screams at intervals. The screams are said to be that of its owner, who was killed sometime in March of some year, which is the same month the screams are most frequent. He is said to have been killed after a spear was struck through the armor’s eye slit.